With traditional waterfall approach, BI happens in a rigid sequence that forces users to give a complete set of requirements upfront, and requires IT to set up an exhaustive data model. 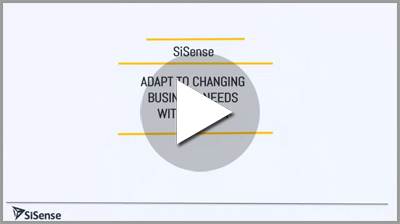 While this approach may ensure you deliver a business intelligence solution, it never guarantees that business users will get what they actually need from the BI project as businesses always have changing business requirements. It can also cause a deep friction between IT and business users, as business users wait too long for IT to deliver, and IT feels as though they receive unrealistic time-frames with changing requirements that don’t cope with technical constraints. This perpetuates an office culture that business and IT are on two conflicting sides, and agile BI is unattainable. In reality, a business’s needs cannot be frozen in time. Business users’ requirements often need to be revised during the life-cycles of a project, and they want the flexibility to investigate data further afterwards. The bottom line: poorly-expressed, misinterpreted, or changing needs on the business side is a reality, and using a traditional waterfall methodology will result in the inability for business users to properly practice business intelligence and fuels frustration and wasted efforts from IT. In order to solve these problems, a new, agile and more pragmatic approach to BI has emerged. Agile analytics is a new, more efficient business approach that can quickly adapt to meet changing business requirements by supporting business and IT collaboration and creating a methodology that permits flexibility. This flexibility comes from: business user input early and often, ongoing scoping, quick development iterations, frequent tests and a direct and constant flow of communication between business users and IT/development. In other words, agile BI makes room from evolving requirements based on close collaboration with business.